Proceed to checkout to provide your delivery details and choose a payment method. Simply wait for your order to arrive within 48 hours - if you like you can track your order online. Serving NZ customers since 1992. Beginning in Christchurch 26 years ago, we are very proud to remain the top choice for consistently high quality meat available in NZ. We are owned and operated by Kiwi farmers. We really do go home to the farm every night however our product comes from all over NZ. We are passionate about delivering the very best proteins we can to your door, complemented by some essential foodie pantry items, made by passionate NZ Foodies. Every now and then we manage to squeeze a wee bit more out of the tube and when we do, we pass those savings straight onto you! Our Gourmet Meat Online Specials often apply while stocks last so don’t delay! Place your Gourmet Beef, Lamb, Free Range Pork or Chicken Order Online now! For something different and if you’re searching for healthy lean cuts that are high in iron, choose Venison or Free Range Rose Veal. You can stay up with the play by joining our email newsletter database. We mail you weekly with news and Product Specials as they are posted plus a brand new Recipe every week! Make every day Gourmet with the touch of a button.Your recipe for success is NZ's No.1 online butcher. Buy meat online today for delivery tomorrow. Your time is precious, so why not enjoy the convenience of the very best, succulent and tender meats NZ has to offer, in one online oasis. With over 100 products on offer, we aim to expand the horizons of your dining dreams. Make every day a Gourmet occasion at the touch of a button. It’s all so effortless and there’s a free phone number (0800 737 800) if you prefer to call your order through. Buy from New Zealand’s favourite online butcher. Every food lover knows the starting point for any great eating experience is the quality of the ingredients. Gourmet Direct products are simply the most reliable, guaranteed never to let you down at the dining table! We are owned and operated by New Zealand farmers, Kate and Perry King. Now celebrating 26 years in business. 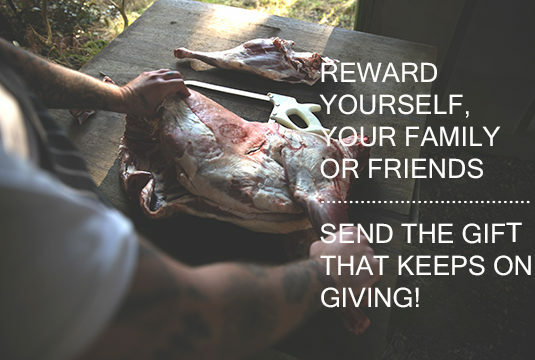 We deliver 100% NZ grown meat, handpicked for outstanding consistent quality every time you buy. Essentially we filter through the thousands of meat products available on the NZ market, selecting only the very best to include in our product offering to our valued clients. We do not hang our hat on one or two fashionable trends, preferring to ensure that the whole package consistently meets our very high expectations in terms of meat quality, animal welfare and consumer food safety requirements. This is how we ensure that our customers are guaranteed the same outstanding results every time we prepare and serve Gourmet Direct products. We deliver five days per week on a guaranteed overnight service. Over twenty six years we have become logistics experts with a packaging and freight capability which is unique to our business and one that, you, the customer, can 100% rely upon. Backed by a full money back Guarantee, we ensure when you buy online you entertain with confidence serving the very best in meat cuisine from Gourmet Direct. Try us out this Christmas and you will notice the difference. Everyone will want to have Christmas dinner at your place. Get a recipe for Lamb or beef or ham from Gourmet Direct. Try our recipes. Whether you’re cooking for yourself or having friends for dinner, you’ll never want to buy meat from anywhere else again. You won’t find more Wow factor than the impact of one of our delicious giftpacks. “The service you guys have provided has been phenomenal!! I can assure you I know great retailing standards on both a local and international level from travelling throughout the world.